Today, let us remember the honor, pride, and freedom brought to our country by paying respect to our Veterans. I am proud to have served my country and now living my life supporting veterans seeking support with post-war trauma. Our deployments might be over, but some of us the war never ends. Like my page! Win prizes and cash! 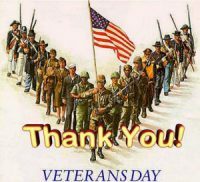 To so many that we have owed so much for so long! !